The earth's water does much more than simply slow down climate change, however. The ocean redistributes heat throughout the world in myriad ways. 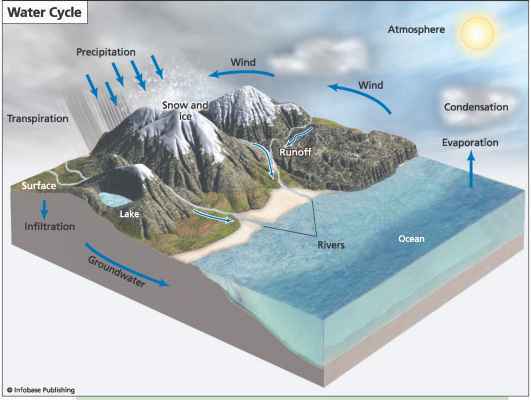 For example, water at the surface of the ocean constantly evaporates into water vapor, which rises into the atmosphere. Eventually, the heat energy is released through condensation, when the water vapor turns back into water and falls as precipitation. This heat cycle is what powers the world's winds, and thus much of the earth's climate. As Robert Stewart notes, "In the tropics in particular, where energy from the sun is at its greatest, the exchange of heat between ocean and atmosphere drives much of the global atmospheric circulation. "3 Ocean currents also redistribute heat by, for example, pushing warm water from the equator north, and thereby moderating temperatures at high latitudes. The effects of global warming on precipitation will be discussed more fully in later chapters.